The Ceylon Petroleum Corporation has introduced a special variety of petrol and Diesel which meets European standards. 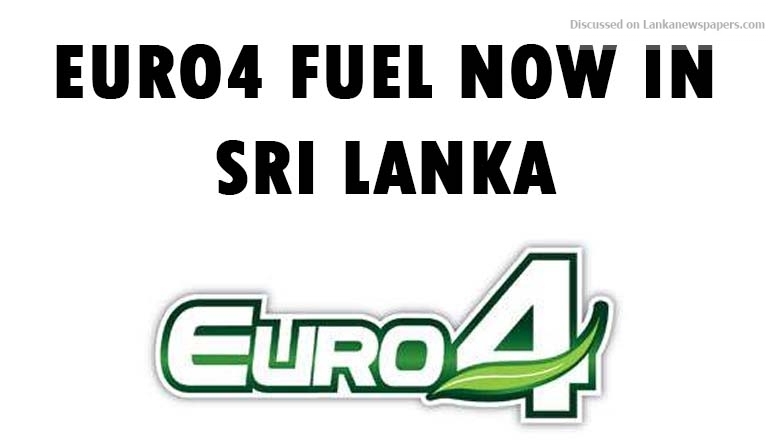 The new Euro 4 standard fuel was unveiled at an event in Colombo today. Super Diesel and 95 Octane petrol are to be phased out of circulation with the introduction of the Euro 4 standard fuel. The Ceylon Petroleum Corporation said that the new fuel variety will be priced at the same price as Super Diesel and 95 Octane. Subject Minister Arjuna Ranatunga was questioned as to where this fuel would be imported from. The minister failed to provide a proper response, so he consulted with his officials and came back to state that the fuel would not be imported from one country and that it would be done through a tender process. When questioned by journalists on the possibility of a fuel price revision, the subject minister noted that they are yet to take a decision. However, he did note that a committee was appointed by the Cabinet in order to meet once in 2 months and discuss the prices of global oil prices and reach a decision on whether fuel prices need to be revised. Responding to a question on the CPC’s decision not to provide fuel to SriLankan airlines, Minister Ranatunga noted that they cannot simply do that because SriLankan airlines is also a state entity. Ranatunga said he believes he would be able to find a solution through discussions with the President, Prime Minister and Subject Minister.